Harvested off the northwest coast of France, Celtic sea salt is gray in color and a little less salty-tasting than table salt or other sea salts. It is found in clay ponds that are built near the shore -- as the saltwater evaporates, a mineral-rich sea salt is left behind. 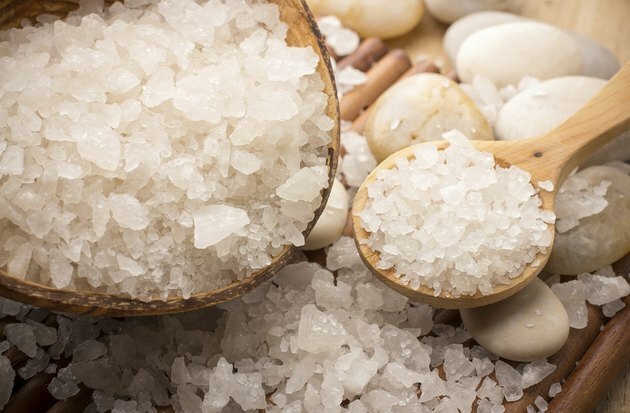 The trace minerals and elements of the Celtic salt are associated with a range of health benefits, including better digestion and helping you to resist infections. Unlike table salt, Celtic sea salt is not processed mechanically or treated chemically. Celtic sea salt is harvested by hand using wooden tools and then left out in the sun and air to allow the last of the moisture to evaporate. Because it is not processed and because no preservatives are added, Celtic sea salt contains 84 different live elements that are commonly found in sea water, according to the Pacific Health Center clinical nutritionist Monte Kline. Celtic sea salt contains magnesium, iron, manganese, zinc, iodine and potassium. It is these trace elements -- along with other naturally occurring ones -- that give Celtic sea salt its gray color. As a natural salt, Celtic sea salt is high in sodium -- it contains more of this essential mineral than any other nutrient. Sodium is needed by your body to function properly, as it helps your body control blood pressure and volume. It is also necessary for proper muscle and nerve function. The upper limit of sodium consumption is 2,300 milligrams for healthy adults and 1,500 milligrams for adults with a history of heart disease, who are over 51 years old or are African-American. According to Kline, Celtic sea salt has numerous healing benefits because it helps to balance out the minerals in your body. It is also helpful with getting rid of excess mucus, which is useful in reducing congestion in your lungs and nasal passages. In addition, Celtic sea salt can help reduce water retention and reduce excess acid levels in your body, as well as give a boost to your immune system and help your body heal more quickly from injuries. A majority of American adults have a diet that is too rich in sodium. Thus, you still need to be conscientious of your Celtic salt intake to keep your sodium consumption within an acceptable range. A diet that is high in sodium can lead to atherosclerosis, heart disease, high blood pressure, high cholesterol levels and an increased risk of kidney disease. Keep in mind that many foods, especially prepared foods, contain added sodium.